“My experience with Ramapo began in 2009 as a student in the MSN in Nursing Education program. I chose Ramapo College for my Masters in Nursing Education because I wanted a program that was not 100 percent online. Returning to school as an adult learner, I was interested in the blended learning format that Ramapo College offered in several of the courses in the MSN program. In the fall of 2011, I was fortunate to return as an instructor in the Nursing Lab and Simulation. I truly enjoy playing a role in students’ achieving their learning outcomes and I am honored to be a member of nursing faculty who consistently demonstrate excellence in teaching. – Debi Nickels ’11 is the Professor of the Nursing Lab and Simulation and first joined Ramapo in 2011. 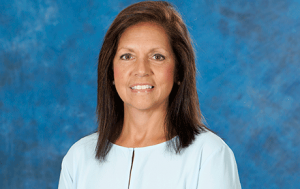 Debi received her BA in Health Care Management from Ottawa University, transitioned her BA to a BSN at Ramapo College, and she is currently pursuing a Doctor of Nursing Practice from Cleveland, Ohio-based Case Western Reserve University. Cahill, K., Nickles, D., & Fonder, P. (2012). Okay to play? A discussion about sports-related concussion. American Nurse Today, 7(2). Sigma Theta Tau International-Phi Sigma (RCNJ Nursing Programs), Vice President.